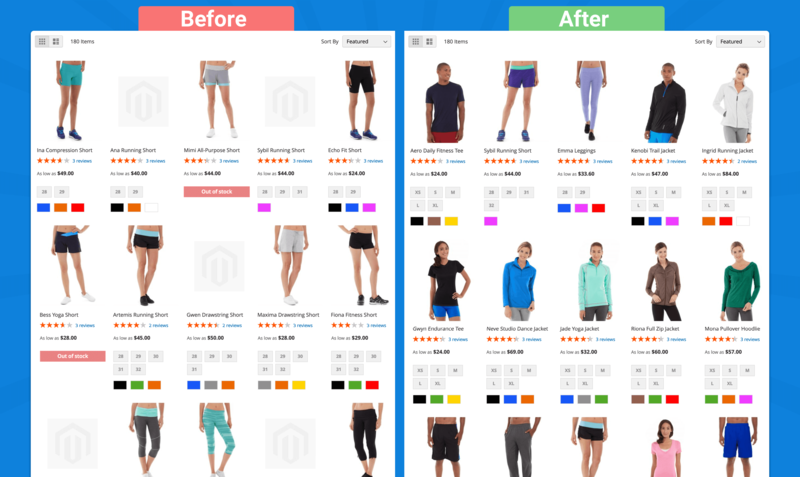 The extension is an effective tool for managing the sequence of products sorting on category pages, search results pages and catalog widgets. With the help of flexible ranging factors, you can easily determine if products should be shown at the product list end or beginning. The better products on the list top meet clients’ expectations, the higher the store sales are. At the same time, if products at the list beginning are not interesting to clients, most probably these clients will not keep on looking at the rest of store products. The extension add new index, that contains weights for each ranking factor - product. When magento add sort order to products collection (plugin), we join this index and sort products by weight (or sum of weights). If sortable option is an attribute, we use native magento sorting logic. The extension uses only plugins for improve sort order logic. No Rewrites (preferences) or observers. There is a possibility for a client to change product sorting on catalog. The extension allows you to manage sorting options that are available to a customer on the front-end. You can also add an unlimited number of sorting options, as well as to determine the default sorting option for the product list or search results page. You can provide your customers with possibility to sort products using any attribute or any set of ranging factors. Depending on configuration, the extension can apply ranging rules both in series (Sort by …, then sort by …) and as a sum of factors weights. Default sorting is critically important, as long as, the more relevant products are at the list beginning, the better the store sales are. That is a reason for sufficiency to place “the best” products at the list beginning. You can create the best product list using different ranging rules combinations, for example, the latest added products (within last 30 days) and, in addition, bestsellers with the best rating. Improved Sorting extension allows you to effectively manage the products sorting on catalog. You can set rules for sorting of different product groups. In addition, you can manage sorting options that are available to store clients. To set up catalog sorting, use the rules for ranging factors determination(sorting rules). The extension includes a wide set of configurable rules, on basis of which you can effectively range products according to different criteria. Usage of the Date Factor allows you to sort products in accordance with the date the products were added to your store (magento 2 sort products by newest). You can set time frames of a rule being applied. For example, you can display products that were added during the last week first, and ,then to show other products with all the other rules after them. Attribute Ranking Factor allows you to manage product position on the list, basing on the attribute values or attributes set. For example, you can move seasonal products to the top of the list or temporarily boost certain brands to a higher position. The Product Rating Factor ranges the products on the basis of number of reviews and product rating (magento 2 sort by rating). Additionally, it is possible to determine the period of time for reviews to be taken into consideration. For example, products with greater number of recent review should get higher priority. Stock Status and Image Factors allow to sort in stock products or products with images. If you set these factors as global ones, out-of-stock products and products without images will be always shown at the end of the list (both in catalog and search results pages). Bestsellers Factor ranges products on the basis of number of bought items within a certain period or lifetime (magento 2 sort by best seller). Profit factor provides you with a possibility to range products depending on the product marge (the difference between cost and price). This factor is the most effectively used together with other, more obvious rules. For example, you can promote a Christmas product during the winter times or move all the 2019 year models to the top of the list. The extension allows you to determine the sequence of products displaying in Magento Catalog Products Listing Widget. This widget can be used to display various interesting offers on the pages of your store. To make the configuration process easier and for your better understanding of different factors influencing the sorting order, there is an option of sorted products Preview in terms of extension. This option works both for sorting criteria and for ranging factors. Very important module for shops with a lot of dynamic information. Product sorting is probably one of the most important parts of a webshop, getting it right is really useful. Being able to fine-tune the sorting for a page without having to manually sort the page is really valuable. This extension is very useful and very powerful. "You can create the best product list using different ranging rules combinations, for example, the latest added products (within last 30 days) and, in addition, bestsellers with the best rating." This point most important for me. Thank you Mirasvit! Great extension and support service. I will buy more extensions. The extension is compatible with most layered navigation extensions (Amasty, Mageplaza, Manadev etc) and all search engines (native MySql, Sphinx, Elasticsearch search engines). Can I set a different default sorting for particular category? Yes. By default magento 2 uses global default sorting for all categories, but on category edit page you can change default sorting for this category. For example sort 'Sale' category by discount amount and 'New Products' category by products' adding date. Can I display 2 bestseller products, 3 recently added products and then all other products by rating? Yes, for each sorting criteria you can add few sorting conditions and limit number of products for each conditions. Ability to use sorting for catalog widget "Catalog Products List"